When you are using a BAL tiling system, or if you are a YOU+BAL member you can benefit from requesting a free site visit to test the screeds readiness for tiling. Call BAL Technical Support on 03330 030160 to arrange a free test! It’s an age-old predicament, can I use a ready-mixed tile adhesive, or do should I go for the conventional cement-based powdered tile adhesive? The truth lies behind how the product dries. Ready-mixed is generally easier to use as it can be spread straight out of the bucket and does not require water or mixing (hence the name). While ready-mixed adhesives (e.g. BAL White Start Plus) are perfect for fixing 300x300m ceramic tiles or metros, at BAL we would never recommend using such a product when using large porcelain (over 100mm x 100mm), large-format tiles and tiling floors. Although ready-mixed is generally cheaper and easier to use, it is worth investing a few extra pounds into a powdered tile adhesive (e.g BAL Rapid-Flex One) for such jobs. Powdered tile adhesives use a different drying chemistry. This provides added flexibility when it comes to the hold and drying consistency, helping the product to dry throughout, rather than in just the exposed areas. Powdered cement-based tile adhesives also provide significant time savings to builders as they can be grouted quicker than ready-mixed tile adhesives. 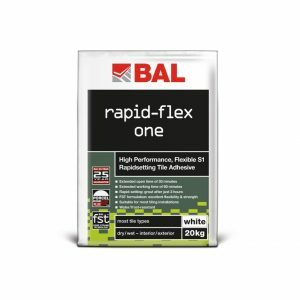 For example, BAL Rapid-Flex One can be grouted after only 3 hours (at 20°C) while a ready-mixed adhesive (such as BAL White Star Plus) may take up to 24 hours to dry and be ready for grouting. Ideally remove, mechanically, about 80% of the old vinyl adhesive residue, exposing the concrete floor beneath. If you are able to do this using a long handled scraper, needle gun (if appropriate) or other type of suitable mechanical abrasion tool, direct fixing of the ceramic tiles may be carried out using e.g. BAL Rapid-Flex One or other suitable BAL Adhesive depending on the background. Priming should only be necessary if the exposed concrete appears to be porous/absorbent after treatment to remove the residues. In this is the case vacuum off all loose dusty material from the surface and prime use BAL Prime APD (Diluted 1:1 by volume with water). 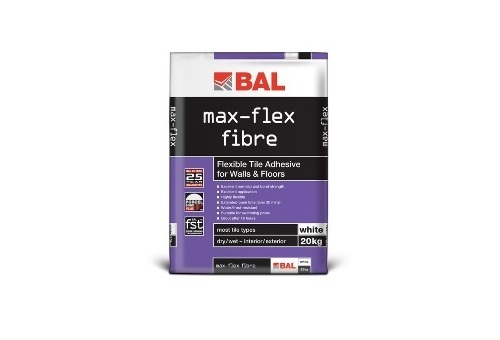 If you are not able to remove 80% of the residue, then providing all of the loose vinyl adhesive residues are removed mechanically and the remaining residues are sound and well bonded to the concrete , apply BAL Level Max in a minimum 3mm bed depth and allow to dry for at least 4 hours before tiling commences. If you are unable to remove the old vinyl tiles, you can also level them with BAL Level Max, provided they are primed with BAL Bond SBR (undiluted ).This can then be tiled after 4 hours. 6. If the existing vinyl tiles are clean,solid and flat BAL Rapid-Flex One can be used direct onto the vinyl tiles without the use of a BAL Bond SBR. If the floor is part of a wet room i.e. water via the shower head falls directly onto it, then it is essential to ensure that some form of waterproof tanking layer is in existance and located within the floor construction in order to prevent water penetration through the floor. We would recommend a product such as BAL Tank-it. Adhesive technology has come a long way from the traditional methods of sand and cement fixing – and boy has it needed to. Back in the 1960s it was recognised that adhesive technology was not keeping up to speed with the demands of new substrates and tile types and traditional fixing methods were becoming redundant. To bring the industry up to date, the British Ceramic Tile Council set up Building Adhesives Ltd in 1962 to develop and manufacture a new range of high quality “new technology adhesives” backed by a comprehensive Technical Advisory Service. 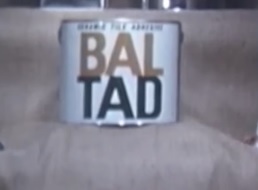 The first products rolled off the line in February 1963 and in BAL’s first years, fixers welcomed the arrival of BAL TAD – its first ready-mixed adhesive – as well as the first BAL Grout. The further development of substrate types, other system materials, the increase in porcelain and natural stone usage and development of large and extra-large format tiles, combined with site demands have meant the development of modern adhesives. BAL has always been at the forefront of new fixing technology introducing industry-firsts such as the first epoxy grout, first tile adhesive using rubber crumb technology, first variable-setting tile adhesive, and first anti-bacterial grout. To this day, BAL continues to develop innovative technology and products to respond to the changing habits of the UK tiling and flooring market. One such development is the introduction of Fibre Strand Technology, or FST. First developed for BAL Max-Flex Fibre in August 2013, FST is one of the most significant innovations in the manufacture of powdered adhesives to hit the market in recent years and is now common-place throughout the industry. Developed in conjunction with fixers and contractors, FST is the result of exhaustive investigation into the use of certain microfibres combined with high-quality, super-smooth, spherical fillers. The microfibres deliver greater adhesion strength, grab and non-slip properties, bringing improved performance alongside extended open times. The improved consistency and smoothness mean the powders are easier to mix, and simpler and faster to trowel out and apply. The greater open times, achieved with no lengthening of drying times, enable much larger application areas, speeding up installation time. BAL became the first adhesive manufacturer in the world to introduce FST into ready-mixed adhesives in August 2013 with the launch of BAL White Star Plus. It has also been into introduced into BAL’s all-in-one levelling compound BAL Level Max. Following its introduction to the market, FST has been introduced into several rapid-setting tile adhesives including new BAL Rapid-Flex One which has an extended open time of 30 minutes and working time of 60 minutes – but is ready to grout after only three hours. This gives fixers all the speed and all the control, which two times longer working time and three times longer working time than most other rapidsets. BAL has also been the forerunner of developing pourable adhesives such as new BAL Pourable One – which can be used up to 25 mm for large format and natural stone tiles – ensuring that the correct coverage has been achieved even with uncalibrated stones. Rapid-setting in three hours and highly flexible, BAL Pourable One is ideal for underfloor and undertile heating, areas of total immersion and installations subject to limited movement and vibration. It can also be used for patch repair. 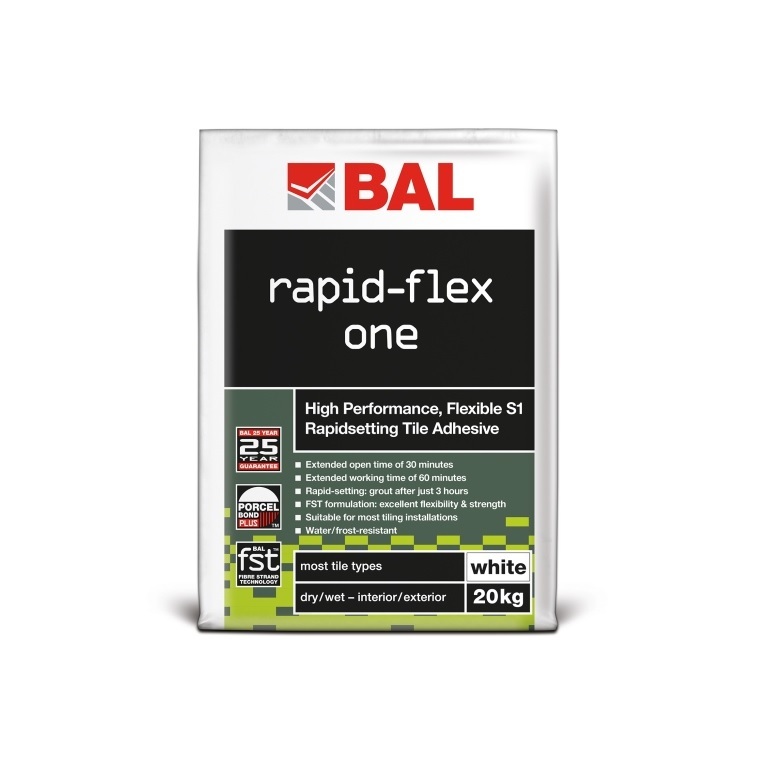 Both BAL Rapid-Flex One and BAL Pourable One offer a breakthrough in adhesive technology with a new white colour allowing it to be suitable for use on all tile types, yet available for the same price as a grey adhesive product. What is the correct PPE when tiling? 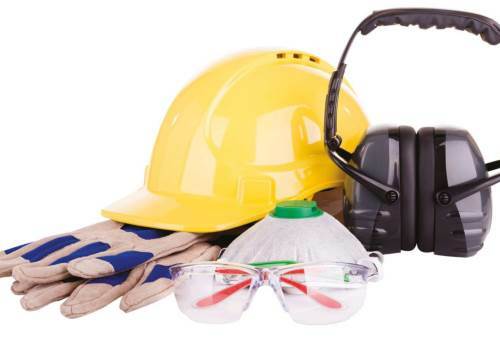 It is highly important to wear the correct Personal Protective Equipment (PPE) when tiling on site or in someone’s home. Tiling without PPE is leaving yourself open to acute injury or long-term health effects – which could stop you working in the short term, or end your tiling career completely. First and foremost you need to protect your hands. Whilst tiling your hands are extremely vulnerable as you handle tiles, cutters, blades and tile adhesive and grout which can be hazardous and cause nasty cement burns if you’re not protected. Wearing protective gloves provide barrier protection against cement-burns or adhesive irritation and can also provide extra grip when handling tiles – preventing any accidents. Some specialist gloves on the market also provide abrasion and cut resistance, giving tiler reassurance when using a tile cutter or cutting instruments. As well as protecting your hands, you should also ensure that you wear adequate eye protection. Your eyes are extremely vulnerable to a number of hazards when tiling, from splashes of adhesive or grout, or chips and shrapnel when cutting tiles. Wearing a pair of wrap-around safety specs provides great protection from all directions – keeping you sight intact. There are a number of products on the market, including lightweight versions and those with anti-mist and ant-scratch lenses. When mixing adhesive, grout or levelling compound, it may also be necessary to wear a dust mask to stop you breathing in harmful dust particles. As well as a dust mask it is also worth investing in an extraction fan, or a device such as a whale tail – a special vacuum adapter which fits around a mixing bucket. And finally, while they’re not a necessity, tilers might also want to invest in a good pair of kneepads. Knees are the most likely to be damaged in construction jobs. Too many hours kneeling on tiles and floors can cause long-term problems such as knee joint arthrosis – damage to the cartilage. Kneepads must comply with EN 14404, which ensures that a particular model meets the minimum protection requirements. The level of benefits, the buffering capacity of the material and comfort are all important issues when choosing your kneepads. Did you know that it is estimated that more than 50% of coverings on balconies and terraces are damaged in Northern Europe due to poor installation systems? A lack of suitable drainage beneath ceramic, pavers and natural stone tiles fixed externally can cause a number of issues including cracked tiles, efflorescence, and stained or patchy tiles – all of which are derived from water damage. Problems arise when water sits on tiles/pavers and cannot drain off the surface or sufficiently through the tiles, joints or screed. When there is nowhere for the water to go, it is trapped in the screed and rises to the tiled surface (this is called capillary active). 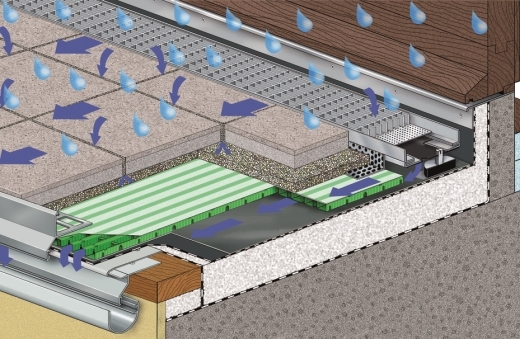 The solution to this problem is a capillary passive drainage system -surface water that is absorbed into the tiled substrate is drained away from the screed and completely removed. The solution is provided through the patented drainage mats from Gutjahr System Technology, now available from BAL. There are two drainage mats within the range, both providing market-leading benefits. AquaDrain EK (the blue mat) has a mesh and is designed for use with most tile types on drainage mortar or epoxy drainage mortar. While the drainage mortar and epoxy screed is capillary active, allowing faster movement of water from the surface through the screed to the base, is the water is not removed it can rise again. That is why the EK mat system is needed to completely remove the water from the system. The green AquaDrain T+ has a specially designed fleece and is used with a direct point adhesion laying system for thin-layer, lightweight outdoor coverings. With the AquaDrain T+, tiles are fixed at points on the surface drainage mat. There is no need for water-retaining mortar layers, and seepage water is rapidly shed through the mat’s drainage channels. Both available in 8mm or 16mm depths for variable height build-ups and fast passive drainage, the innovative mats are designed with special meshes and fleeces, tailored to the specific requirements of the covering and laying method. The patented “arch” shape guarantees the fleece/mesh does not sag and reduce drainage like some alternative mat systems. Thanks to the unique arch system, and mesh/fleece which prevents the lime and mortar entering the cavities, the mats have more than 90% drainage volume – guaranteeing the fastest and best drainage volume in the market. Alternative systems employ “dimples” where drainage capacity is much weaker, due to the sagging effective of the mesh into the drainage channels, blocking the flow of water. A 12mm alternate mat often performs lower than an 8mm AquaDrain mat! Gutjahr drainage mats also have a 66% contact area on the channels, meaning an optimal load distribution, protecting the membrane from collapse. Many specifications recommend uncoupling mats and not drainage mats for external tiling, but this causes problems of its own. Specifically that uncoupling mats only uncouple, and have no drainage capacity. Cavity mats are even more counter-productive as they retain water in their cavities and are capillary-active! So it’s clear that simply fixing externally with just adhesive or drainage mortar/gravel will not prevent costly damage and the use of a drainage mat system is highly recommended. At BAL we will be putting on specialist Gutjahr training sessions to show interested fixers and contractors the ropes. If you’re interested in signing up to a Gutjahr training session, please email training@bal-adhesives.com. 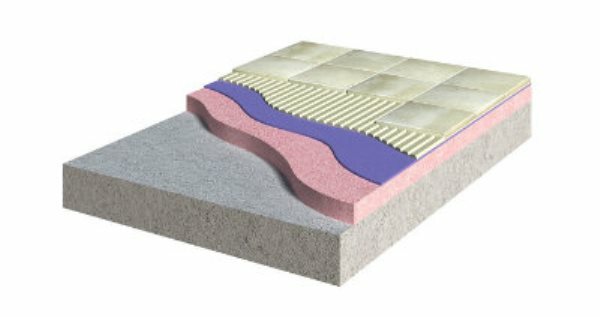 To find out more about Gutjahr System Technology, part of BAL External Tiling Solutions, please visit www.bal-adhesives.com/external-tiling/ and select your zone. With their popularity increasing by the year, heated floors are soon becoming the norm for tilers when starting on a job. Heated floors cause fluctuations in temperature which makes the screed, adhesive and tiles expand and contract. While the screed and adhesive expand at a similar rate, tiles have a lower coefficient of thermal expansion meaning they grow at a different rate. This can cause the tile to crack or debond due to the stresses placed at the interface between tile and adhesive. If tiling onto a Hot Water Pipe system (usually incorporated into a reinforced mortar screed), ensure the screed has fully cured. This ranges from one week with BAL Quickset Cement to a minimum of three weeks for a screed containing OPC. For anhydrite, hemihydrate or calcium sulphate screeds, extra drying time and screed preparation is required. It is advisable to contact BAL TAS directly when this is the case! Following this period of curing, the screed may then gradually heated up to a maximum operating water temperature of 45° as recommended by the heating manufacturer. It should be maintained at this level for three day, before allowing it to cool to room temperature. Ensure that the heating system has been turned off, or on in cold temperatures, to ensure the screed is at 15°C before tiling commences. When using cable systems, check with the manufacturer to ensure the system is compatible with the intended substrate and application areas i.e. wood, screed, kitchen, bathroom etc. The cables should be bedded into a layer of self-smoothing compound such as BAL Level Max. When using BAL Rapid Mat uncoupling system, the heating cables should be below the membrane and encased within the levelling compound. Again check with the manufacturer that the chosen system is compatible with the substrate and to the environment it is being used in. 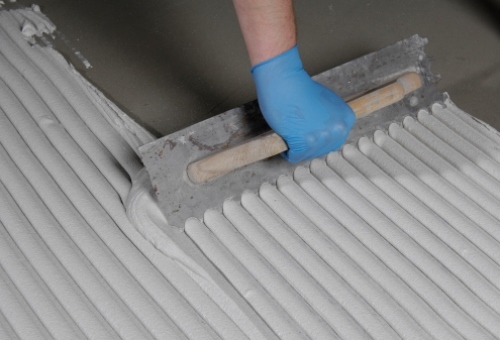 Before tiling, the surface of the mat should be primed using a contact adhesive, prior to the installation of tiles using the correct adhesive – which we will come onto. Movement joints and control joints should be incorporated at all perimeters of the screed, including upstands or anything which penetrates the screed, such as columns or pillars. Movement joints are usually formed whilst the screed is being laid. It essential that movement control joints penetrate the full depth of the screed to the insulation layer. Once tiling commences, movement joints should be incorporated to coincide those in the screed. For floors subject to thermal changes, such as under floor heating, floor area should be divided up by movement joints into bays of size, not greater than 25m2 with and edge length of not greater than 5m. When using uncoupling systems, the bay size can be increased to 40m² and edge length no greater than 8m². If using BAL Rapid-Mat, the mat should be separated where intermediate movement joints penetrate through the thickness of the tile and bed down to the membrane place on top of the reinforced base screed. When tiling onto concrete or cement:sand screeds or plywood overlaid floors (min thickness 15mm), a flexible adhesive is required to counteract any thermal movement. Suitable adhesives include: BAL Single Part Flexible, Flex, BAL Rapidset Flexible, BAL Rapidset Flexible Fibre, BAL Stone and Tile PTB, BAL Max Flex Fibre. 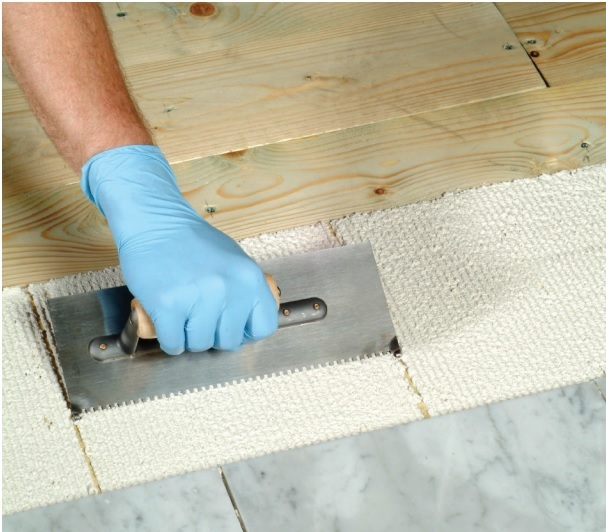 For single layers of timber, or where plywood overlay is less than 15mm, consider the use of BAL Rapid Mat uncoupling mat and a flexible adhesive, or BAL Single Part Fastflex– a specialist rubber-crumb adhesive with advanced flexibility. As with your adhesive choice, your chosen grout should also be flexible to allow for thermal movement. Recommended BAL grouts include: BAL Superflex Wide Joint Grout or BAL Micromax2 (BAL Micromax2 with BAL Admix GT1 diluted 1:2 by volume with water when tiling onto single layers of timber when using BAL Single Part Fastflex as the adhesive or when plywood overlay is less then 15mm). Due to the large number of heating system on the market, we would also recommend to contact BAL Technical and Advisory Service (TAS) for advice before any work is carried out! Easy to lay, low cost, fast-drying, pumpable and self-levelling, anhydrite screeds or calcium sulfate have grown in popularity over the last decade for new builds and renovations/extensions. However despite the numerous benefits associated with laying an anhydrite screed, fixers need to be aware of the many potential pitfalls and problems when tiling. The main issue with anhydrite screeds concerns moisture content and associated drying times. Because anhydrite screeds have a higher moisture content and dry through a chemical reaction followed by evaporation which drastically increases the time it takes for the screed to reach no more than 75% relative humidity (r/H %) or 0.5 Water by Weight (w/w) as required by British Standards. When fast-track tiling is required consider the use of a Damp Proof Membrane such as BAL DPM. BAL DPM can be used on anhydrite screeds up to 87% RH. Because of this need to reduce the moisture content, the drying time for anhydrite screeds is approximately 1mm per day up to 40mmin ideal drying conditions i.e. air temperature of 20C with a relative humidity not greater than 65%. Drying times will significantly increase for thicker screeds or those in poor drying conditions. This means a typical anhydrite screed dries in about 49 days. Compare this to an OPC (Ordinary Portland Cement) screed which is dry in around 21 days, or even BAL QUICKSET CEMENT which dries within 4 – 48 hours, then you see where issues may occur. Before tiling onto anhydrite always test the moisture content using a Hair Hygrometer (tests r/H%) or Carbide Bomb Testing (w/w). Accelerated drying of anhydrite screeds may be used once the screed is at least 7 days old. It is at this point that we would recommend commissioning any underfloor heating. The system should be increased by approximately 5°C per day until the maximum required working temperature is reached or as per the underfloor heating manufacturer’s recommendations. This should be maintained for a minimum of one week, before being gradually reduced to around 15-20°C. Another common cause of failure when tiling onto anhydrite screeds is Ettringite formation. This occurs when the cement in a tile adhesive reacts with the gypsum in the anhydrite screed, forming mineral crystals at the interface which can cause debonding. To combat the formation of Ettringite, ensure that the surface is dry and seal with an appropriate BAL prime. Priming creates an effective barrier and assists in making the surface more stable. Contact BAL TECHNICAL ADVISORY SERVICE (TAS) for further information on dilution ratios. As anhydrite cures, a weak layer of laitance is formed at the surface. This laitance is too weak to tile too and will also slow the drying process. Laitance should be removed by light abrasion using a suitable sanding machine i.e. a rotary floor scarifier and a 60’s grit sandpaper. Remove excess dust completely with a vacuum cleaner. Abrading the surface is best carried out 4-6 days after the application of the screed and can assist in the drying out process; this will be done by the screeder. Once the screed is dry, the surface must be scarified again by the tile fixer to remove laitance and any surface contamination. Scarifying the surface is even recommended with low laitance Calcium Sulfate/anhydrite screeds as this further aids adhesion. All traffic should be kept off the screed until it has hardened sufficiently in accordance with the screed manufacturer’s instructions and should always be protected from contamination and damage from other trades. Once the screed is fully dry and before tiling commences it is best to protect the screed fully by using boarding. When selecting your tile adhesive, consideration should be given to tile type and application. 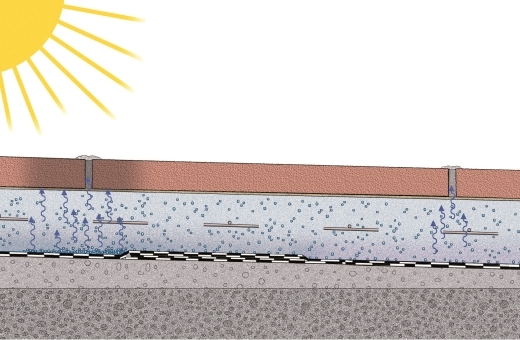 Consider the impact of water penetration into the substrate. Flexible Slow or rapid-setting tile adhesives can be used, depending on the tile type and environment. When the adhesive is cured, the joints between the tiles should be filled with a suitable flexible grout – a minimum of 3mm is usually recommended for grout joints and movement joints must always be considered, using a profile movement joint or silicone sealant such as BAL Micromax Sealant (which can be colour-matched with BAL Micromax2 grouts). For further information regarding preparation, adhesives, grouts and movement joints please contact BAL TAS. *This is not a technical guide, always follow the manufacturer’s guidance and contact BAL TAS. Don’t let your installation be a damp squib – waterproof your background correctly! 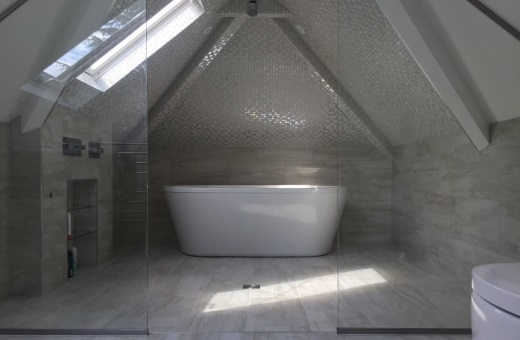 Ensuring your wetroom, bathroom or shower installation is fully waterproof is crucial part of any tiler’s work, because tiles and grout on their own will not inherently protect against water damage. Thankfully BAL has launched a new waterproofing system – BAL Tank-it – which is specially designed to include everything required to allow tilers to waterproof internal or external areas, such as swimming pools, spas, hot tubs, terraces, balconies and even fountains in a quick, easy and simple way. A two-part product with 5kg powder, 5ltr liquid and 20m scrim tape (each sold separately), BAL Tank-it fully waterproofs the background behind the tiles to prevent water penetration and covers approximately 7m2 at 1mm thick. As a result the kit prevents water saturating the whole area, reducing the risk of unsightly black mould forming, and drastically reducing the risk of more serious issues such as floor collapse and other surfaces vulnerable to corrosion. Applying BAL Tank-it is incredibly easy – especially as no priming is needed unlike other waterproofing kits on the market. Simply apply the scrim tape to corners, junctions, penetration points and cracks in the substrate, then mix the powder and liquid as per packaging instructions and apply using a standard 4mm notched trowel and float, brush or roller. What makes BAL Tank-it stand out is its rapid-setting nature. Thanks to its unique formulation, it can be tiled after only 90 minutes – making one-day installation a real possibility! Don’t forget that all BAL users can rely on us for complete project support. No other brand can offer so much experience and expertise including free technical advice, free on-site consultancy, free training and free specification service. “When do I need to prime?” “How many coats do I need?” are questions I’m often asked. Priming can be an absolute minefield, but by following some simple rules it couldn’t be easier. 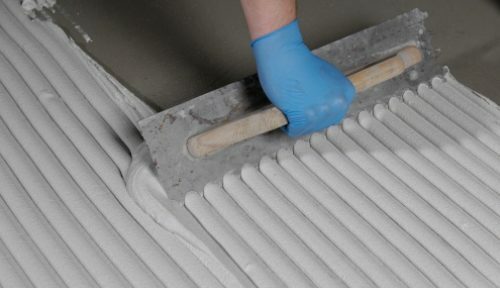 Before tiling, certain wall and floor backgrounds must be primed for a number of reasons including; to reduce porosity (absorbency) of backgrounds or bases (preventing the formation of air bubbles), to minimise risk of chemical reaction with cement-based adhesives and to add surface strength to friable (weak) surfaces. Priming also helps prepare surfaces for waterproofing, or for preparing surfaces prior to the use of a levelling compound. 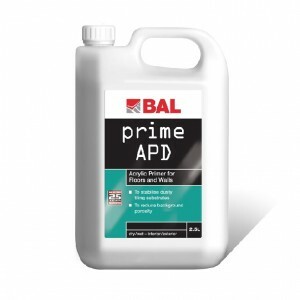 The following key substrates/backgrounds should be primed using BAL Prime APD, two coats neat – gypsum plaster (if using cementitious adhesive) and tongue and groove floorboards. Gypsum plaster can also be primed using BAL Bond SBR diluted 1:2 with water when using cement-based adhesives, or 1:4 if using BAL ready-mixed adhesives. If priming gypsum plaster before using ready-mixed products, BAL Prime APD can be used diluted 1:1 with clean water in one coat. 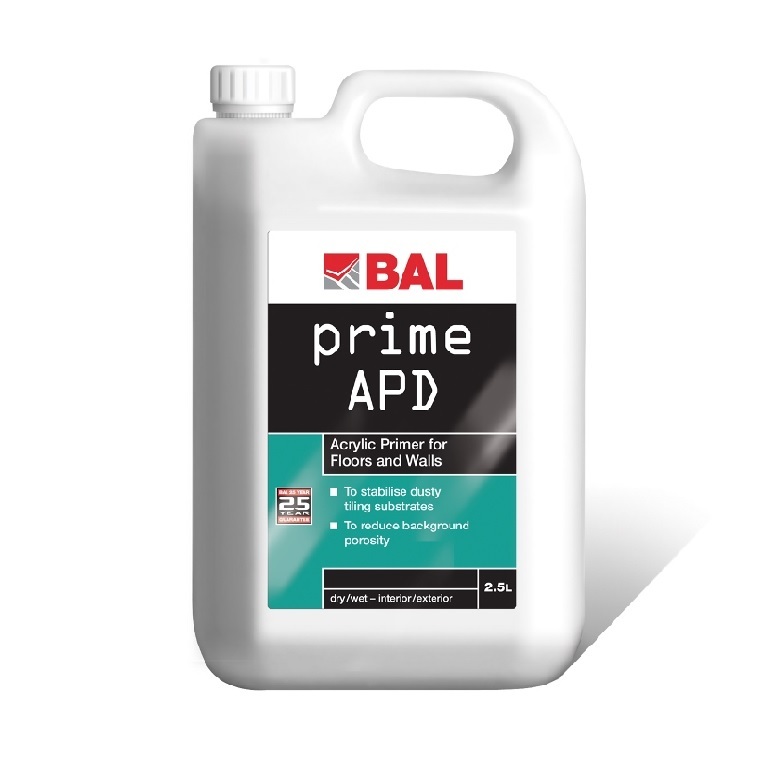 One to two coats of BAL Prime APD should be used for lightweight blockwork, and two coats (first coat diluted 1:1, second coat neat) for calcium sulphate or anhydrite screeds. If required, i.e. the surface is dusty or friable, you may also want to consider priming cement:sand render, concrete and cement:sand screeds with one coat of BAL Prime APD to give the surface you are tiling to more strength. Remember to always seek further advice/guidance from board manufacturers. If tiling on fibre-reinforced cement sheets, or plywood/chipboard, then we would always recommend priming the reverse side and edges with BAL Bond SBR. This helps protect the plywood from moisture penetration which could cause the board to swell. When priming with two coats, it’s always good practice to apply the second coat at 90° angle to the first coat, with the one coat horizontally and one coat vertically (always allow each coat to dry). This ensures complete coverage of the background. If you’re unsure whether to prime or not, it’s always worth your time consulting our Technical Advisory Service. If you don’t want to tile to bumpy surfaces then you need a decent surface on the floor screed. But what exactly is a screed? For tiling this is simply a floor covering designed to provide a hard-wearing, permanent and smooth surface. Screeds come in a number of materials from traditional sand:cement, which can be fast-tracking (for example by using BAL Quickset Cement), calcium sulphate/gypsum screeds and Lime-based screeds, to smoothing and levelling compounds such as BAL Level Max. Applied to a mature concrete base or slab (at least 6 weeks old), screeds can come in a number of forms including bonded, un-bonded, floating and heated – all of which can be modified. Alternatively apply a suitable smoothing and levelling compound. Modifying can improve the property of the screed for example reducing shrinkage or to improve strength. Less shrinkage reducing the chances of curling, and improved physical and mechanical strength can reduce the minimum thickness applied for certain applications. Un-bonded (modified) screeds are typically applied over a damp proof membrane (dpm) laid over a concrete base. Minimum thickness should be 50mm at any point, designed to a thickness of 70mm. They must be cured initially as rapid drying may increase the risk of curling. It is recommended to cover the screed with a polythene sheet in the first week initially before allowing to dry further in air. This is to avoid rapid drying out which may cause shrinkage cracks and also increases the risk of curling. Floating screeds are usually applied over a thermal and acoustic layer on top of a base , for example insulation materials. When applying a floating screed it is essential to include a steel mesh to reduce the risk of cracking. 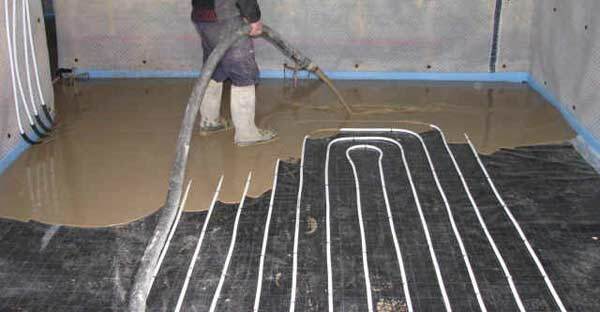 Heated screeds are applied over a wet or electric heating system on top of a thermal insulation layer over concrete. Reinforcement is achieved by steel mesh laid just above the heating system. Adding fibres in the screed mix can help to minimises early shrinkage cracking and improve flexural strength. It is important to remember that heated screeds need to be commissioned correctly before any tiling is commenced. Levelling screeds, such as BAL Level Max, are laid to achieve SR1 surface regularity – that is under 2m straight edge with a gap no greater than 3mm. This is required for the application of ceramic tiles, using a suitable tile adhesive. Fast track screeds, such as BAL Quickset Cement, are a good substitute for traditional Ordinary Portland Cement (OPC) and can be used for all types of cement:sand screeds. When laying the screed ensure that it’s mixed to the right consistency i.e. for semi-dry consistency –squeeze the mix in a gloved hand to check that it retains its shape but does not crumble. Apply the screed using a float, or pumping machine to a battened area, and level using a screed bar drawn across the surface. Tamp down using a screed float and finish using a wooden float. Once laid, allow at least three weeks to cure when using traditional OPC, at least 4 hours (bonded screeds) or 48 hours (unbonded and floating screeds) when using BAL Quickset Cement – .Drying times can vary with thickness andambient conditions on site. For calcium sulfate screeds the drying time is approximately 1mm per day up tp 40mm in ideal drying conditions, but requires additional drying time for screeds above 40mm. Boards should also be used to protect the screed from traffic and contamination. Before tiling a primer may be recommended for the prepared screed surface before application of the tile adhesive. Priming creates an effective barrier and assists in making the surface more stable. When selecting your tile adhesive, consideration should be given to factors such as the tile type, and the type and method of cleaning of the floor whilst in service – i.e. how wet the finished floor may become and what are the risks associated with limited water penetration. Slow or rapid-setting tile adhesives can be used, dependent upon the tile type and environment. When the adhesive is set, the joints between the tiles should be filled with a suitable grout – please note that a minimum of 3mm for floor tiling is recommended. I hope this blog gives you a good initial guide to screeding and the techniques required. If you are interested in finding out more about screeding and screeding techniques, why not sign up to our Screeding Masterclass. To find out more about our range of courses click here. Welcome to my first monthly training blog on BAL’s fantastic new website – designed to give trainee fixers and college tutors comprehensive support and tools. Firstly, let me introduce myself. I’m Dave Rowley, Training Manager at BAL with responsibility for internal training at our new Innovation and Technology Centre and supporting training at colleges across the country. I have more than 23 years’ experience in tiling, having joined the industry upon leaving school and gaining a City & Guilds Advanced Craft qualification through an apprenticeship at Hamil Tiles. I joined BAL in 1992, and have been training manager since 2000. I’m also Chairman of the TTA Supply Chain Committee, an active member of the TTA Fixer Training Committee and a Lead Judge for Wall and Floor Tiling for SkillBuild – the national construction skills competition. 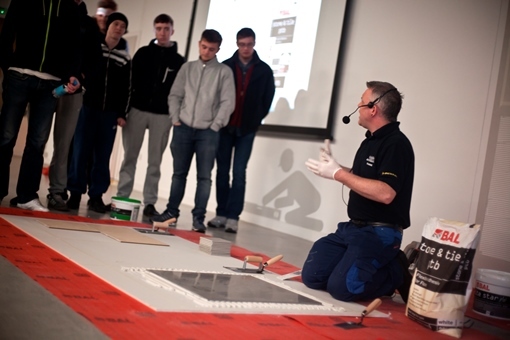 Training is extremely important to me, as I believe it is key to the continued success of the tiling industry. For me it is crucial to ensure that workmanship remains at a high level throughout the tiling industry – and that tile fixers, tutors, tiling contractors, specifiers and tile retailers have up-to-date product knowledge and technical expertise to be able to adapt to changing trends, tile materials, tile fixing products, backgrounds and environments. If bad practices start to happen, this will result in tiles not being used and other materials being specified instead resulting in the loss of work for all in the industry. At BAL we have invested significantly in training – especially with the development of our new Innovation and Technology Centre (ITC). Opened in March 2015, our ITC leads the field in training and innovation – providing a purpose built facility including a state-of-the art 40-seat demonstration auditorium, practical training bays, meeting rooms and more. We encourage tutors to bring their students down to the facility in Stoke-on-Trent to take part in bespoke hands-on wall and floor tiling courses, visit our factory and tour our research and Quality Control laboratories. As well as in-house support, we can also bring training to your college through our extensive nationwide network of Product Support Technicians. Supporting our training structure is this fantastic new online digital resource where tutors and students can access a range of training guides, literature and point of sale material. What’s more, we’re giving students the chance to get on the jobs ladder with our fantastic, innovative Apprenticeship Tool connecting students looking for apprenticeships with tiling contractors searching for apprentices. Simply post your details upload your CV and for potential employees to view. Regularly updated with fresh content and information, we hope this website will become your first port of call when looking for wall and floor tiling training information. So get exploring today, and please let us know your thoughts! I will focus on discussing the latest trends and hot topics in training in my blog, but if you have any topics you think would be good to discuss, please let us know using the below contact form.